Rural Revolution: Major has a reprieve!!! !!! !!! !!! Major's back! Really he is! We had, as you can imagine, a most depressing day. I tried doing schoolwork with the girls, but when Younger Daughter broke down during math, I knew it was useless. Instead we all busied ourselves with unnecessary and trivial tasks, trying not to look at the clock. Major's vet appointment was at 2 pm. So with sorrow we said goodbye to our old friend and I helped Don load Major into the car. Then the girls and I spent another hour busying ourselves with unnecessary and trivial tasks, trying not to think about what was happening. But then Don called us from the vet's office and said Major is alive! The vet looked at that horrible lump on his head and determined it was a serious but treatable infection. The girls and I burst into tears. Suddenly we all felt fifty pounds lighter and set about tidying the house with gladsome hearts, laughing, giddy with relief. 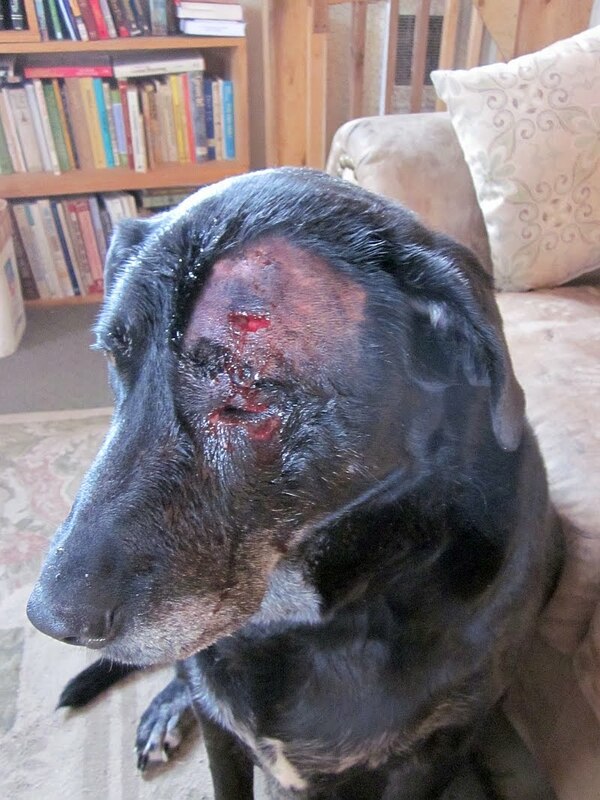 It seems that an infection somehow got under the muscle on his forehead and was wreaking havoc. Frankly it was a near thing, the vet said. How he got the infection isn't known; it may have actually entered through his eye. So now Major's home and Lydia is happy! He's still a bit dazed and probably quite uncomfortable. He's facing two weeks of antibiotics, warm compresses twice a day, and a diet. But he's home! I can't thank you enough for all your kind thoughts and prayers. I'm just so durned happy they weren't needed! Major is still a senior citizen and we don't know how much longer we'll have him, but it sure is nice to put off the inevitable for the time being. So happy for you as I read your wonderful news! YAY!!!!!! (((poor Major))) YAY!!!! (((whatta roller coaster of a day for you!))) YAY!!! So glad that Major is back on the road to recovery!!! God is GOOD!! YAY!!!!! I'm so thrilled that Major is back home with his family! I read your post later this afternoon with sadness and thought to myself, I wonder if it was an abcess that presented itself. My mother had a dog that had the exact same thing happen with the eye and ear affected from the abcess on top of her head. They're not sure how that happened, but thought maybe a scratch or bite of some sort on top of the head from another animal that wasn't noticeable and then it just seemed to be there big as life one day! She also had a cat that had the same thing happen one year and it came on very quickly like that too. The vet cleaned it up, gave med's and both of those animals went home and lived long lives! He looks very sore, but I know you'll give him lots of love and attention and he'll be back to his old self again. My prayers are with Major and all of you. This is great news! I'm sure Miss Lydia is thrilled to have her old buddy back. So very, very, happy for all of you and Major! Thank you for posting pictures as we have a yellow Lab here we named Polly that someone had set out. She has the same looking thing on her head right above her right eye. Wasn't sure what it was. Have been cleaning it with peroxide and putting neosporin on it but will check with my Vet on giving her antibiotics. Oh praise God! We have an old black lab too and I was feeling your sorrow since I read the first post earlier today. Rejoicing with you. The Lord is good. Yippie! Give Major a doggie biscuit from all of us! Such good news! Like others, I was feeling pretty sad after your first post about Major today. We have a yellow lab just over a year old. My husband just walked in the door from taking him to the vet after we found blood in his urine this week. Everything seemed to check out okay but due to a high red count we have to watch him. How we all love our pets! My goodness! He has quite a bump that looks painful, but he sure is blessed to have a good family standing by him, for however long he has left. Awesome! looking a little battered and bloody but unbowed. Truly a warrior's spirit. May we all learn to be as good people our dogs seem to think we are. I'm very happy for Major and your family. I think you should change his name to Lazarus! I'm so happy for you and you family. Jumping and leaping and praising God! Patrice, I'm so happy to hear Major is back at home. Keep up the antibiotics and warm compresses. As for the diet, you do what you think is right. Our senior pets need to be spoiled every now and then. He loves ya'll as much as you love him. Dogs are always considered family in my book. I spoiled my senior Bouvier and he was 15 years old and I spoil our Chihuahua. What can I say, I love dogs. Give Major a scratch for me. Maybe I was the only who caught it, but you mentioned at the end of your blog "I can't thank you enough for all your kind thoughts and prayers. I'm just so durned happy they weren't needed!". Well I say they were needed and they were answered, just not the way you expected for sure. God loves to give us the desires of our hearts. Yes Major will eventually pass on, just like the rest of us, but for the present he will bless you with maybe a couple of more years. I was reading through the comments and was going to add my note at the end saying that indeed I was sure that the kind thoughts and prayers had been, indeed, needed for Major. We cried tears of joy when we heard the good news. We think dogs are 4-legged angels, sent to help us learn patience, humility and love. And as a result of that, our faith is made stronger through them. If we let them, dogs will make us all better people. God bless Major and God bless our favorite family! That is wonderful! Thank you, Lord. All right! Such good news to start my morning, this after half of a huge oak tree fell on my cottage this morning while I was in the shower. The bright side is I'll have lots of good oak firewood! Get well soon Major, girls give that tuff ol guy a hug for me! Do you know Gisele BENOIT? This is a wonderful animalier painter. She founded with her parents themselves animalier painter and filmmaker, the SAS. She lives in total immersion and disconnected from civilization for six months of the year in the heart of the boreal forest in Canada. Visit his gallery of paintings: it is magnificent beauty. A big hug for MAJOR the dog, it's good news! Oh goodness! God has blessed the old guy. Outstanding news about Major, it certainly makes me feel good and I'm sure you and the family are ecstatic! I had to deal with a similar situation with my Doberman, Baron, last year and he's still around, all be it, a whole lot less than he was. He's still paralyzed in his rear feet but has a doggy wheelchair that allows him to move around for about four hours a day. During the other times, he lays on his orthopedic bed and has to be turned every two to four hours with has his diaper being changed about every hour or so during the day. It is hard work to keep my buddy of over ten years around some to do his job of being alert and to sound the alarm when something is not right. It really is good news about Major and thanks for sharing! Mu prayers for Triumph and PEACE was answered! Shalom, L'Chaim, Patrice and Family! As I was praying for Major and your family yesterday, the thought kept coming into my head that this was not Major's time to die. Of course, I couldn't bring myself to tell you that - I was afraid to get your hopes up (how hard it is sometimes to fully trust that God does still speak to His people!). How wonderful and merciful is our God!!! Crying major (Major) tears of joy for your whole family! That brought tears to my eyes. We had to put down our faithful friend of 14 years in December. I am glad you get more time!! Spider bite or thorn? When I was in junior high school, my uncle had a dog that had run of their 126 acre farm-once every now and again, he would get an abscess whose origin wasn't really obvious,and the vet said it could be the result of a thorn-puncture wounds tend to get infected. Spider bites can make nasty wounds, too. So happy to hear that your Major is home and safe. Please give him a hug from me....how precious to have him around for a long long time. He's just not a dog...he's family!!!! Just catchingup-ok, now you made me cry twice. I'll cry those tears of joy any day. My daughter had a similar thing happen with her lab. Hope he bouncs back and you enjoy every special day with him. That's great! I'm so glad Major is alright. He looks so dignified. I've been so busy for the last couple days --- I didn't know what was happening. But I'm so glad everything is okay! Those abcess infections always pop up seemingly overnight and are a fright when they break through the skin. They look hideous! Those meds will work miracles. His cleaned-up wound actually doesn't look that bad. I can only imagine your relief when you got the news that Major would be okay. I've taken that long horrible ride to the vet before, too. But, I've never been given news of a reprieve like you got. Major will live out his days with affection and doting, I'm sure. He's a lucky doggie! Utterly excited overheard! It's ways hard to loose a child, yes our pets are our children too! I'm so glad he can be with you a little more, rejoice and spend many more days playing and cuddeling! Wonderful news! Glad he is on the mend and you have the blessing of his love (and he yours) a while longer.